System Center Operations Manager (SCOM) gives you great insights in your IT infrastructure. (Pro) active monitoring you’re environment enables you to respond quickly to alerts and (maybe) prevent outage. One way to get informed is by hanging monitors in the “IT room” with dashboards displaying the environment. You can create a “view” in the Management Console displaying the information needed. Ideally a dedicated machine boots up and displays the view you created. You can start the System Center Operations Manager with the option / ViewName: <viewname> to open the console and show the view. The reason this error is displayed,instead of the view, is that you’ve specified the display name instead of the internal name. Unfortunately the console doesn’t supply a method to retrieve the internal name (nor does the webpage). But you can retrieve the name from the database instead. 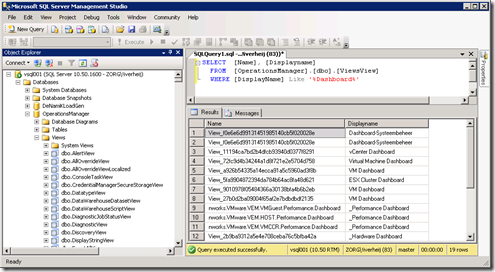 Open “SQL Server Management Studio” (or another utility if you wish) and connect to the database server. Open the database “OperationsManager” (if you used the default database) and open the Views Folder. 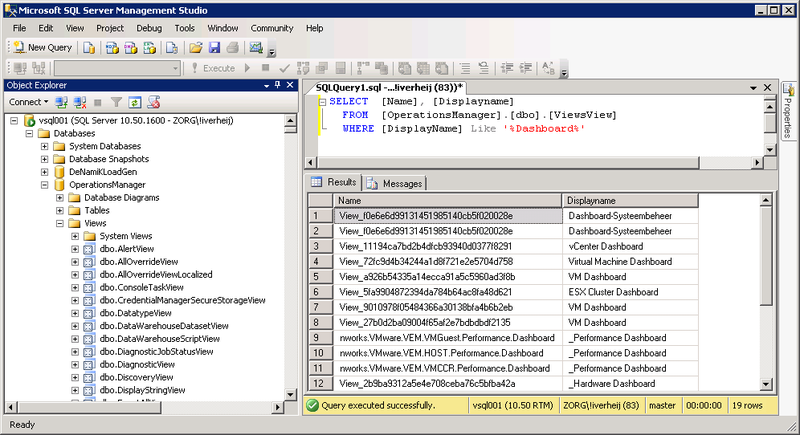 In the Views Folder open the View “dbo.ViewsView” and filter the Displayname with the name of the view. The column Name shows the internal name which can be used as an argument in the Microsoft.MOM.UI.Console.exe /ViewName: <ViewName>. The Name looks like View_f0e6e6d99131451985140cb5f020028e. Unfortunately I don’t have access to a SCOM 2012 environment so I can’t check this for you. Once I can get my hands on it, I’ll let you know. Is there a solution, please?